This plugin is aimed at replacing (hopefully temporarily) findmyStuff, and overcomes the current and ongoing 2-Factor-Authenication issue that it seems all icloud libraries currently have. As I understand it - The current state of play with 2FA is: Main - PyiCloud, now Python 3 library Does not support 2FA, it supports 2SA - which is different. After some code changes we can get 2FA to work - however it times out after 2 hours and needs re-authentication a new code. Clearly this isn't going to work. This was initally envisioned as a quick update to iFindStuff enabling bypassing of non-functional 2FA. However updating iFindStuff began a rabbit hole I almost didn't escape out of! And instead went down this path of writing a new plugin. FindFriendsMini It uses FindmyFriends icloud Service to enable tracking and mapping of enabled friends. It works somewhat differently to FindmyStuff and also has less information available. It does not use your 2FA/Main icloud account. So this main account remains 'save' and you do not need to share details of this main account with the plugin. The plugin allow location tracking and mapping of device/friend locations. It bypasses 2FA problems (which remain in the base python libraries currently) by not enabling it for the account used. It also allows GeoFences to be created and then lets you know how many are within and for how long. Create an potentially new icloud Account (WITHOUT 2FA turned on) ie. Your Indigo mac computer. (Some will have this already for imessage etc usage) Important: This account unfortunately needs to be also enabled and logged on to a iOS device (ie. ipad/iphone). (at least once) Turn on FindmyFriends on this iOS device. Do not turn on 2-Factor-Authentication for this account. For those Friends/Family you need Indigo to track - send a friend request from this new account/or other way around. Once accepted those friends and your new icloud/ndigo account will show up on your findmyfriends application in everyone’s device. If the Indigo account is in the findmyfriends account you should be good to go. Create new iCloud account indigo@icloud.com Sign in on IPad/Iphone * *Sign in to FindmyFriends app on iphone/ipad Send a friend request to those you want to share location with. E.g friend1@icloud.com, friend2@icloud, friend3@icloud.com If and when they accept you request they will show up in Findmyfriends app. Install the plugin from Plugin Store: Setup your indigo@icloud.com account details in plugin config. Add new FindFriendsMini Device - selecting which friend. E.g friend1@icloud.com Create a new FindFriendsMini Device for each friend you wish indigo to locate. The plugin will populate the custom states and location for each of these devices and create a hybrid google map for all the friends, and one for each friend individually. Apple Account ID: Your new icloud account, setup on ipad/iphone without 2-factor-authentication enabled. Update Frequency - Hours inbetween update checking. - Checkbox to open Plugin Store in default Webbrowser if update at time of check. Debugging - Turn On/Off - Debug Level 1-3 - & 4 which will open generated maps and url within browser. FindFriendDevice - Select the friend from the pull down box Give it a Unique Name Rename the Indigo Device as you see fit. These are updated at the frequency set in the main config. Allows triggering on state: eg. if >20 minutes since someone left and 0 friend within Geofence - do something. 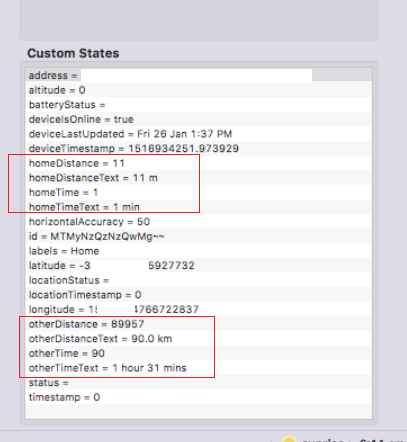 Whilst this doesn't recreate all the functionally of FindmyStuff -- it locates my set devices/enables address display and mapping control page display which was my main usage, and now GeoFences for actions. Fix or offline device label error. Remove API key from Map Image Generation - still using GoogleMaps just not with API key. This may break on 11th June - may not... if so will deal with it then. Add Additional Map Sources for after 11th June. Some positives and negatives with each - ArcGis World Imagery - Satellite Map Similiar to Google Maps Satellite. No Central Marker possible - add to the control page would be my suggestion - ArcGis World 2d - ArcGis World Street Map - OpenStreetMaps - Good quality street map. Can use markers seperate for each device. Add Friend Device Options 'Mapping Label' Primarily for OpenStreetMap[ eg. lightblue1 etc Color and then displayed number Can label each device with different number. Final addition to accuracy settings for Geofence entry/exit Done. The End. No more changes. Adds ZachBenz fix for 'followers versus following' Code was using followers, but should have used those we were following. (In case a someone we were following isn't a follower!) See github issue #16 for those interested and lost! Bug fix if icloud debugging enabled - deleted unused pyicloud routines, and dependencies but left one debugging line in. Create small separate FFM-GeoFence log file for data collection of these accuracy ratio/settings - in normal log file directory. Happy to finetune ratio if more data seems to suggest makes sense. Currently ratio of 2 - seems to be ideal spot. Remove module six dependency by above. Add action group to allow change in interval checking. Fix bug for GetData via action and plugin Menu. 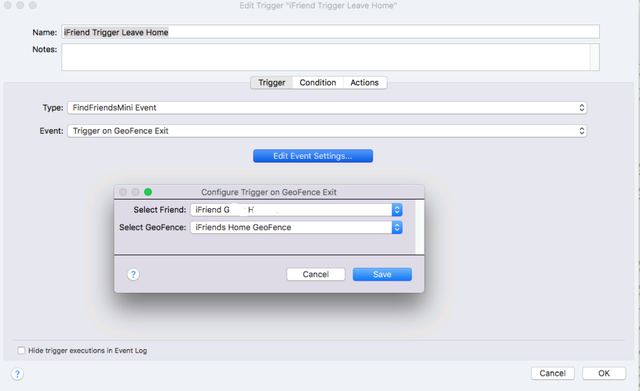 Create trigger/Event which is selectable within Indigo by Friend and Geofence. Two selectable, either exit GeoFence or Enter Geofence. 0.4.9 - Bug fix to reenable trigger disable for first 60 seconds after startup - Add new Device url: google maps url showing device center. 0.0.6 Change to locale specific DeviceLastUpdate Date time.